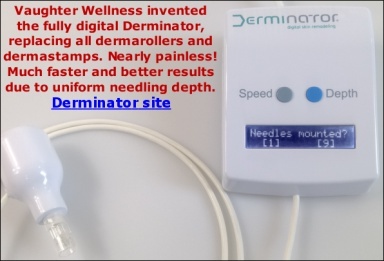 How long does the swelling last after you needle with individual needles (2mm) or 1.5 dermaroller? I found a few threads relating to this topic already. I believe the general idea is the longer the needles, the longer the healing of inflammation, redness, and swelling. Then again, it can be totally on a individual basis. I believe some people just heals faster than others. And some just heals slower than others. You will usually get a mild swelling lasting up to 24 hours when rolling with a 1.5 mm dermaroller. Individually needled acne scars or stretchmarks/surgical scars: Swelling will gradually diminish and can last up to three days, depending how densely and deeply the dermarolling is performed. Swelling will subside much quicker than redness. Redness can last for many days in densely and deeply needled scars. The redness of "spot scars" like acne scars disappears quicker than redness after needling long patches like stretch marks or surgical scars. Just needle one scar as a test patch to see how your skin will react and how quickly the swelling and redness will last.